Capture images of the underwater world with your Nikon D5500 or D5600 DSLR camera in this 200DLM/C Underwater Housing from Ikelite. The housing accepts interchangeable dome and flat ports for a broad array of lenses. For complete compatibility details, see the DLM Type C Port Chart. The enclosure is depth-rated for 200'. An Ikelite sync cord bulkhead with manual hot shoe enables the connection of optional external strobes. Ergonomic mechanical controls including push buttons, dials, and levers afford access to virtually all camera functions. Built for durability, the enclosure is made in the USA from a corrosion-resistant polycarbonate and ABS plastic blend. 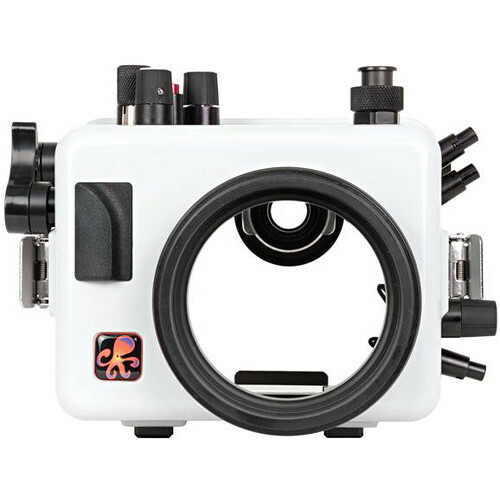 It is white on the front, top, sides, and bottom, but clear in the back to allow you to monitor the O-ring seal and maintain your view of the camera's rear controls.